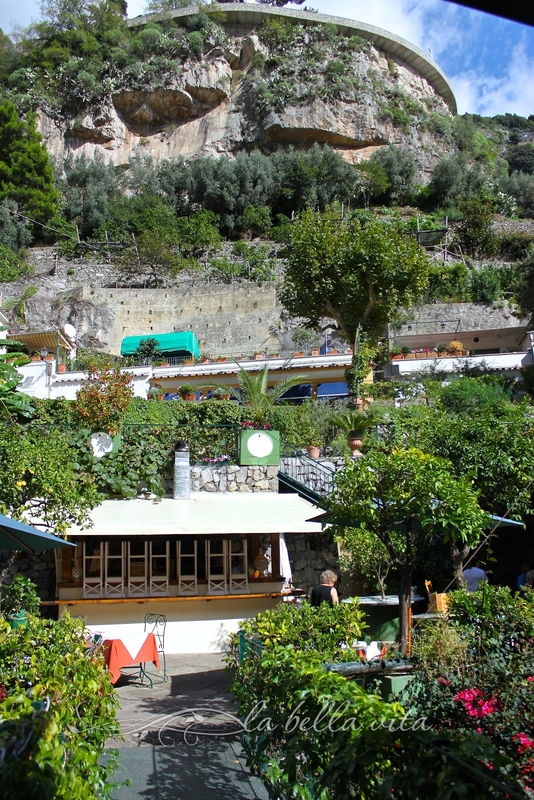 Lemons grow in abundance from trees that cling from the cliffs of the spectacularly beautiful Amalfi coast. 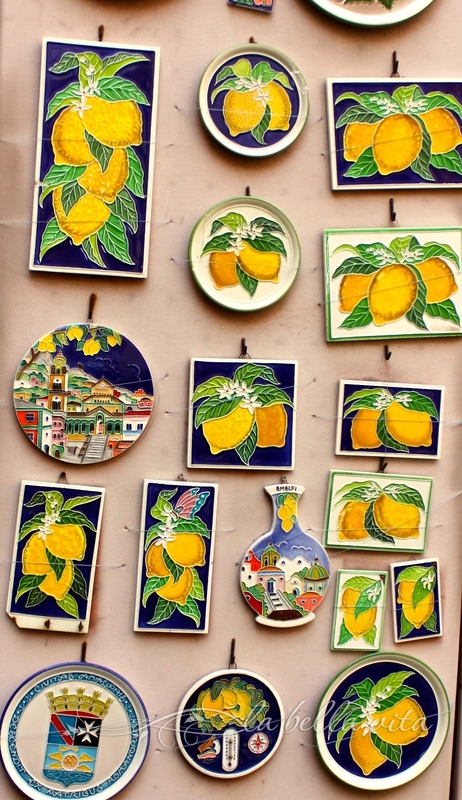 It is along this steep and jagged coastline of the Tyrrhenian Sea that huge lemons are harvested three times every year. 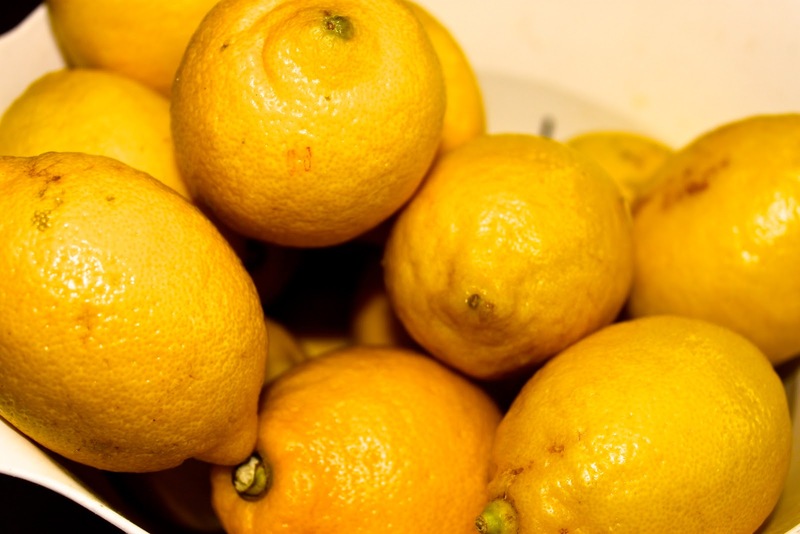 Amalfi lemons possess a unique sweetness that results from a combination of the volcanic soil, year-round warm temperatures, and a perfect amount of rain. 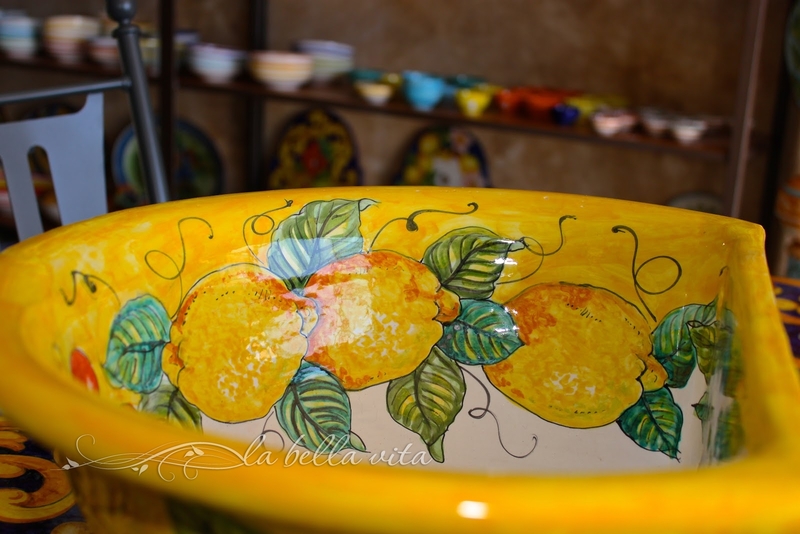 In the kitchens (cucine) of every ristorante, trattoria, or home along this divine coast, lemons are a part of the life and cuisine of the locals and used for everything from cooking, to cleaning, to beauty treatments. As always, nothing is wasted in Italy. 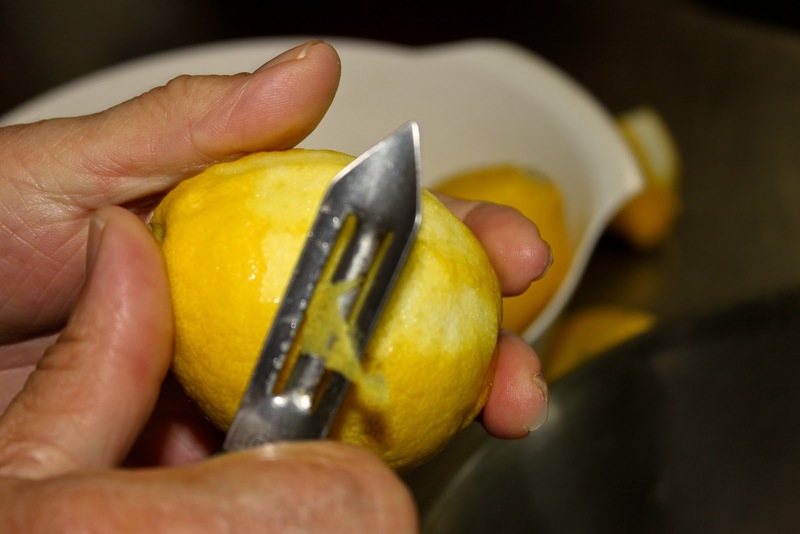 During the last week of my trip in Italy, all of my senses were immersed into the influence that lemons have in Italian cooking. Mid-week, my mother and I ventured into the dream-like mountainside town of Positano where rainbow-colored buildings appear to be carved out of the rock. 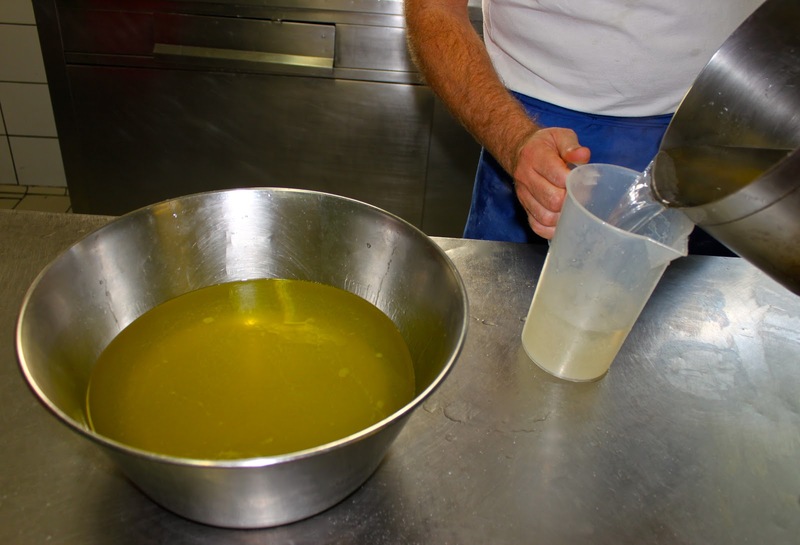 We drove down the spiraling road into the town for a class on how to make limoncello and to learn more about the difference between various olive oils. It was so interesting and we certainly learned more about lemons and olive oil from Italy. yes, that is the road at the top of the photo . . . literally, a true cliff-hanger! a closer view of the nail-biting Amalfi Coast drive that lives up to it’s infamous reputation! 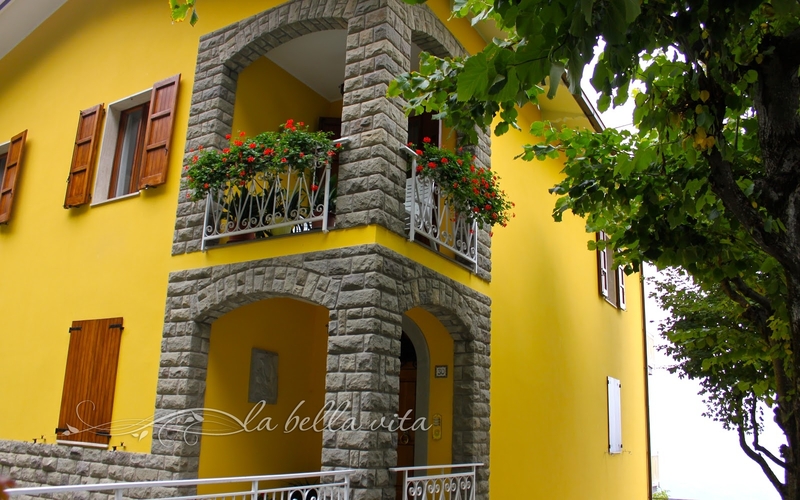 homes are built on top of each other in the very little amount of space in Italy! Population density of the United States: 84 people per square mile! Space is a premium in Italy and when you include thousands of tourists, Italy is very crowded. enormous lemons the size of baseballs! olives, olive oil, anchovies, sun-dried tomatoes, and artichokes . . . all delicious! 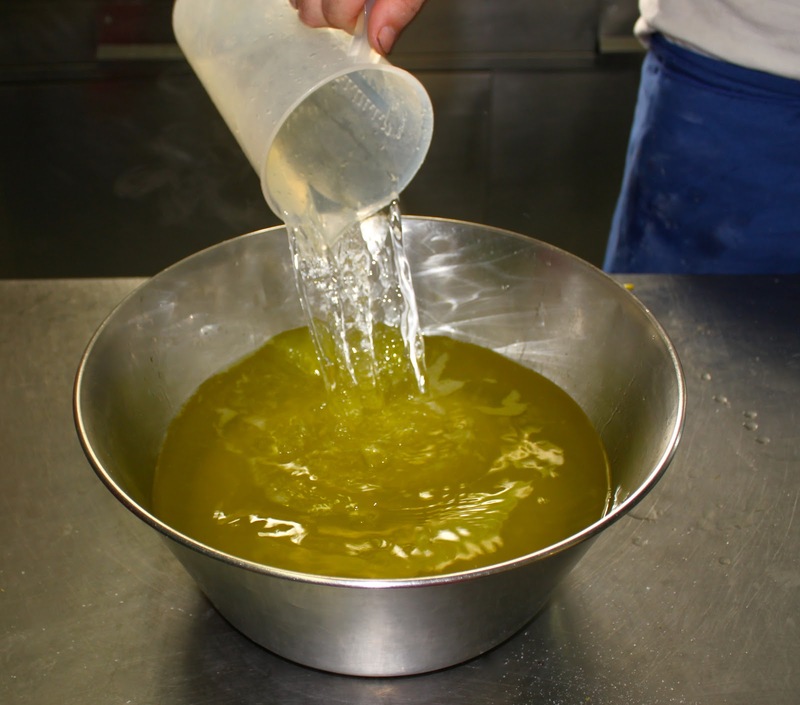 OK, so where’s the recipe for limoncello and step-by-step photos? and the color ‘yellow’ in the landscape! 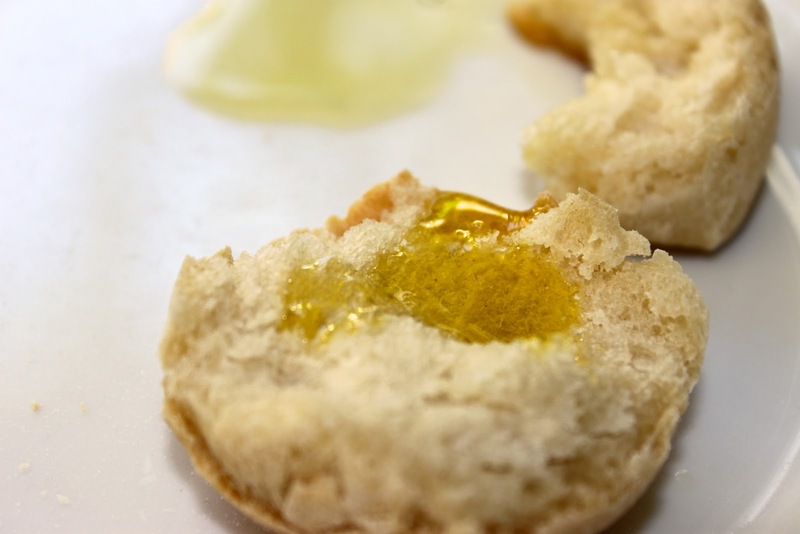 Lemon-flavored Italian cookies (Zuccherini) . . .
oh these were SO good, not too sweet and oh so lemon-y! 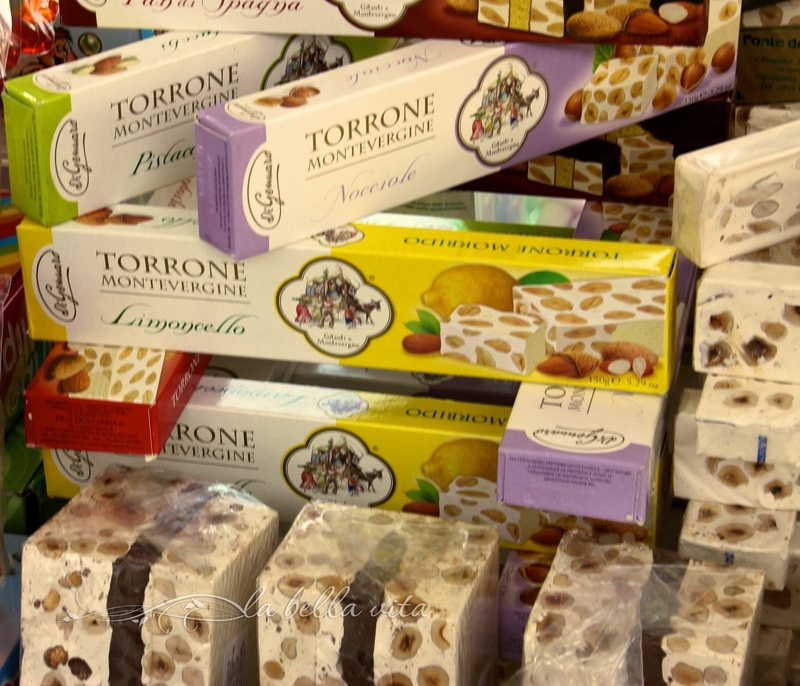 My family LOVES ‘torrone’ a sweet nougat candy with nuts from Italy! I bought a box of the limoncello-flavored torrone. I remember my Nonna enjoying this candy every Christmas! 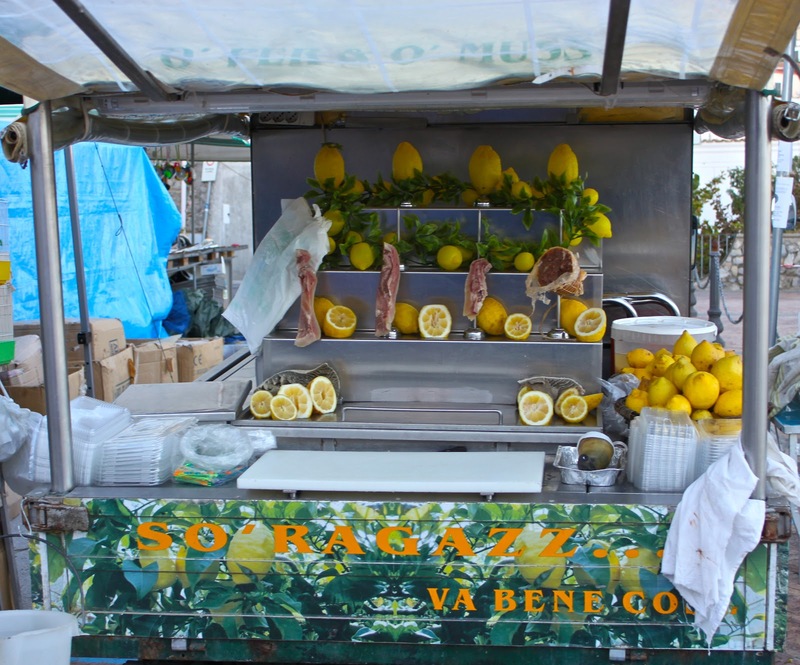 A lemon granita stand at the same festival for St. Luke in the village of Praiano. 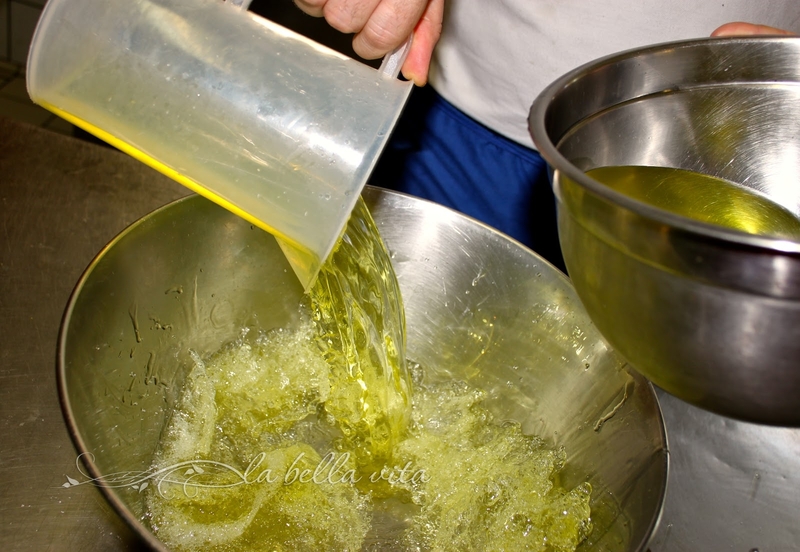 Lemon granita is now one of favorite icey treats, oh so much better than snow cones! after the cooking class. The flavor was so refreshing and light! my home, had it not been for the price ($1000.00) and the price of shipping! But oh how I fell in love with this little table! 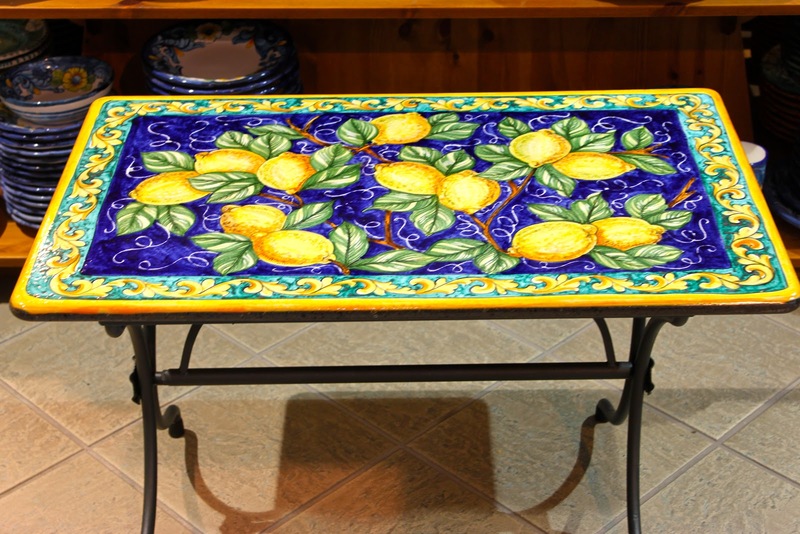 However, I did give in to indulgence and purchased this lemon-colored sink with lemons and blue fig motifs! 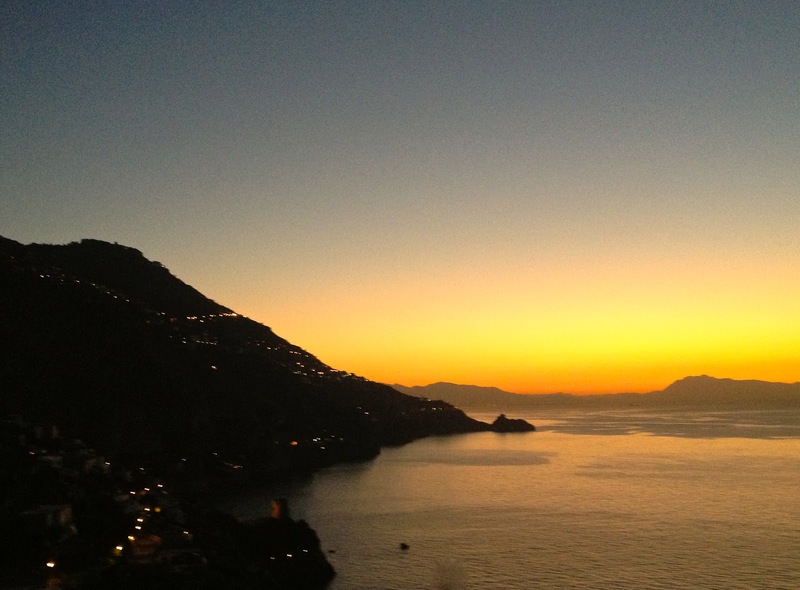 and remember the Amalfi Coast every time! of the painted churches, homes, and shops. where you can take a boat over to the little island of Capri. and not on the Amalfi Coast. 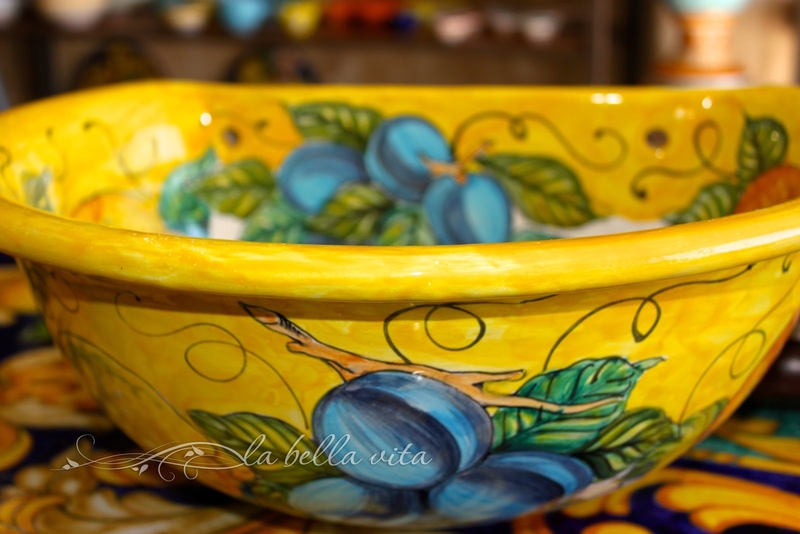 Yellow and gold are simply very popular colors everywhere in Italy. 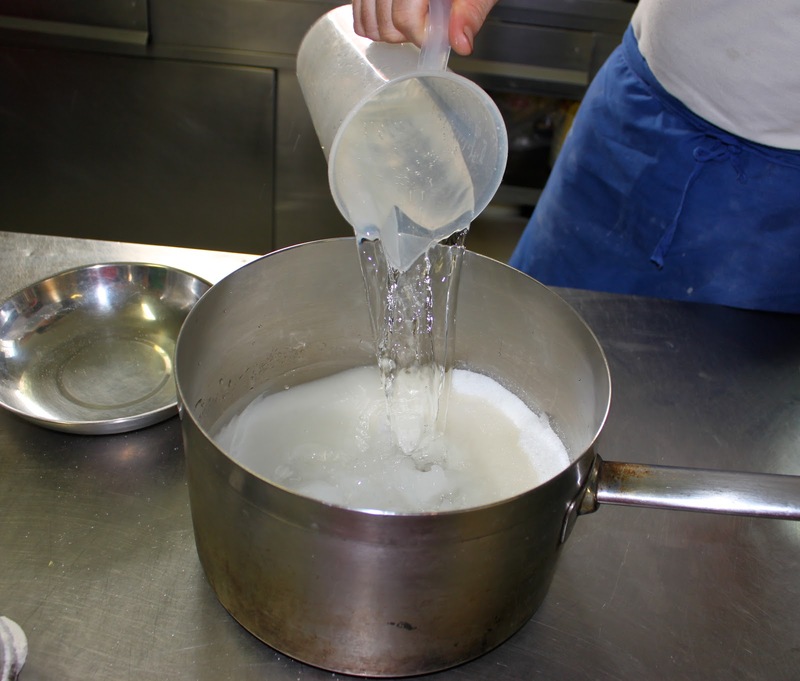 from our cooking class on the Amalfi Coast! Peel very thin slices of the lemon rinds, trying not to slice into the white flesh under the rind.
. . . other than my mother, we were certainly novices at this! 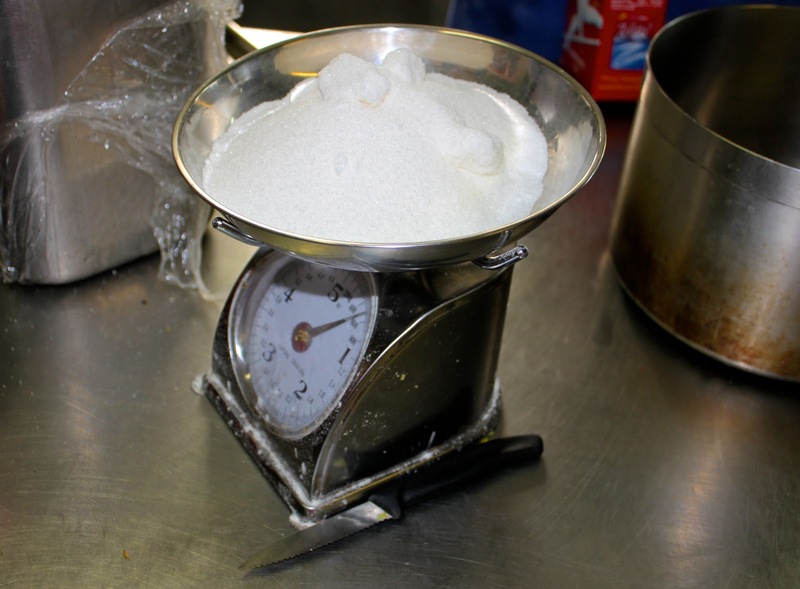 stir well and pour back into big jars or containers; seal well. 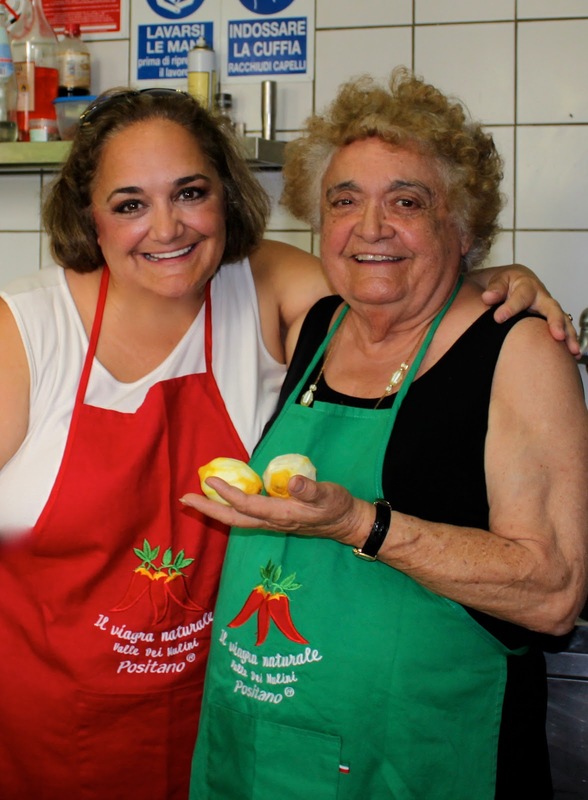 my mother and me during our limoncello class straight from Positano, Italy on the beautiful Amalfi Coast! the limoncello was certainly the best! The tomatoes in Southern Italy have a flavor that is so unique and different from those grown in the States . . . more pungent, sharp, and tangy. And my oh my, is dining out in Italian ristoranti EXPENSIVE! These three ravioli were $20.00! 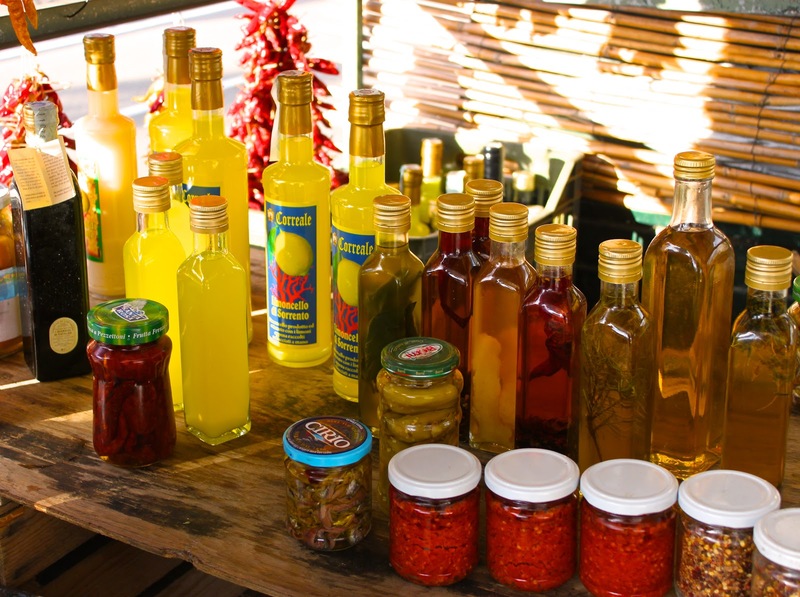 We were so glad that we rented a villa and bought groceries from the local market where food was so cheaply priced! For one week, we only spent $130.00 on food for the three of us and only ate out twice. . . . leaving more euro to spend in the shops! where we would enjoy brilliant colored sunsets every evening . . .
with full tummies comforted a little bit more with Limoncello! Previous Post: « Prosciutto, Parmigiana~Regiano Cheese, Tortellini and Balsamico Vinegar in an Airport! Roz, I just wanted to let you know that if I see one more of your tantalising, gorgeous posts about your trip to Italy I might just have to abandon my children and get on the first plane out of here and head there to Italy! OMG!!! It’s been my dream to go all my life and I am planning a trip there next year hopefully. I’ve thoroughly enjoyed all your posts and they’ve given me so much information about where to go and where to stay. Thank you so much for all the information. I know where to come if I have any questions. Just beautiful! First of all I love the photo of you and your mom, and those shops you would have to pry me out of there! I’m sure I would have one expensive shipping bill. Beautiful trip, especially because you got to share it with your parents! Beautiful photos. I too like the Amalfi Coast but those roads! I swear you go around the corner so tight you look for your bottom from the curve before. Looking down at all the houses and the water is just dreamy. Sweet photo of you and your mom… I have never seen so many lemon products…would love taste every single kind. 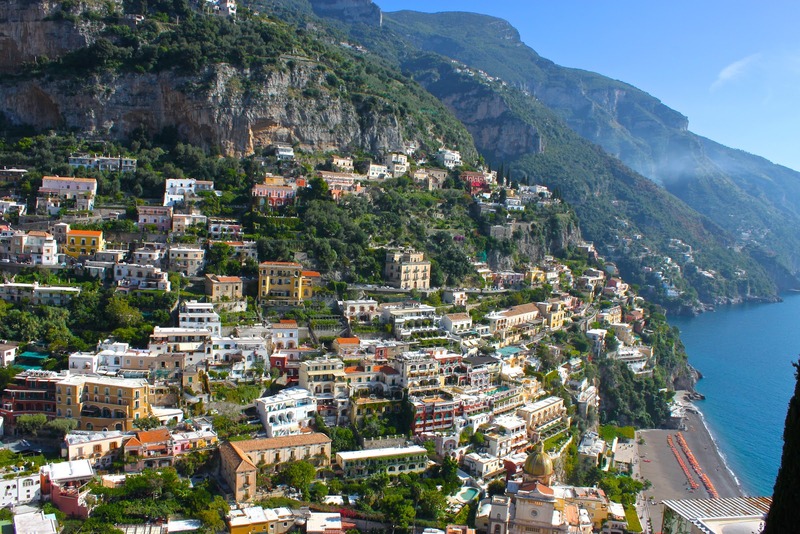 Breathtakingly beautiful Amalfi and Italy! Mama mia! The volcanic soil of the Amalfi Coast may be exploding with lovely lemons but just like Anne, I’m bursting at the seams to go to Italy. As always, thank you for your heartfelt tales of your ancestors’ homeland. 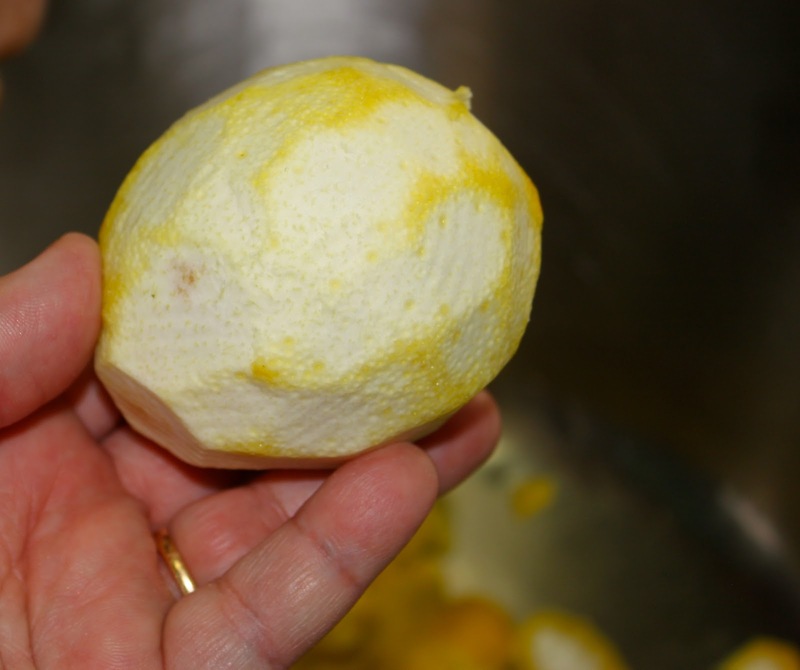 if life hands you lemons- make limoncello! LOL! The limoncello looks beyond amazing. Sweet and perfect! I loved seeing your mom for the first time! Ya’ll are sooo cute! If you get a chance check out my blog this week- I have a wonderful cookie tower giveaway! 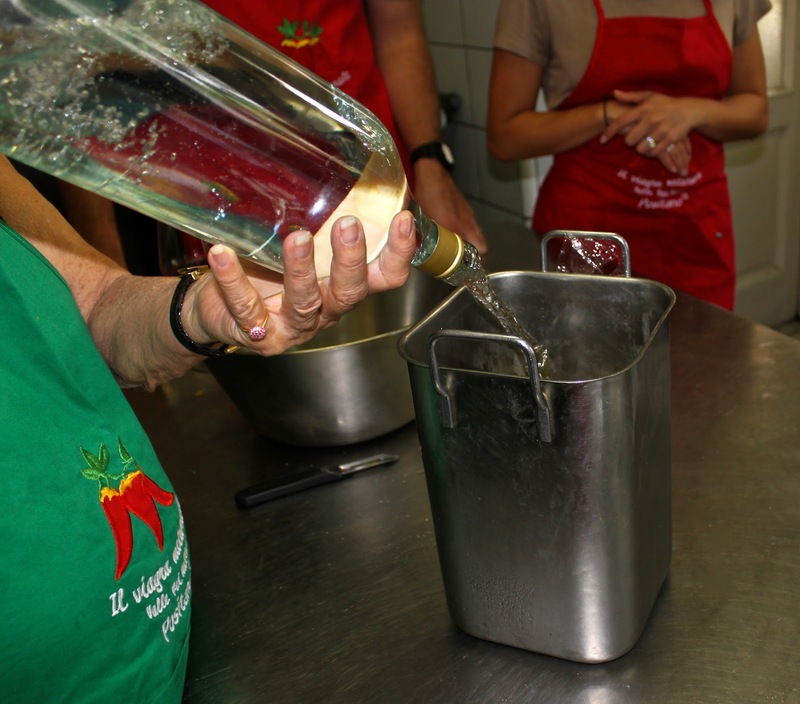 How fun to make limoncello with your mom. 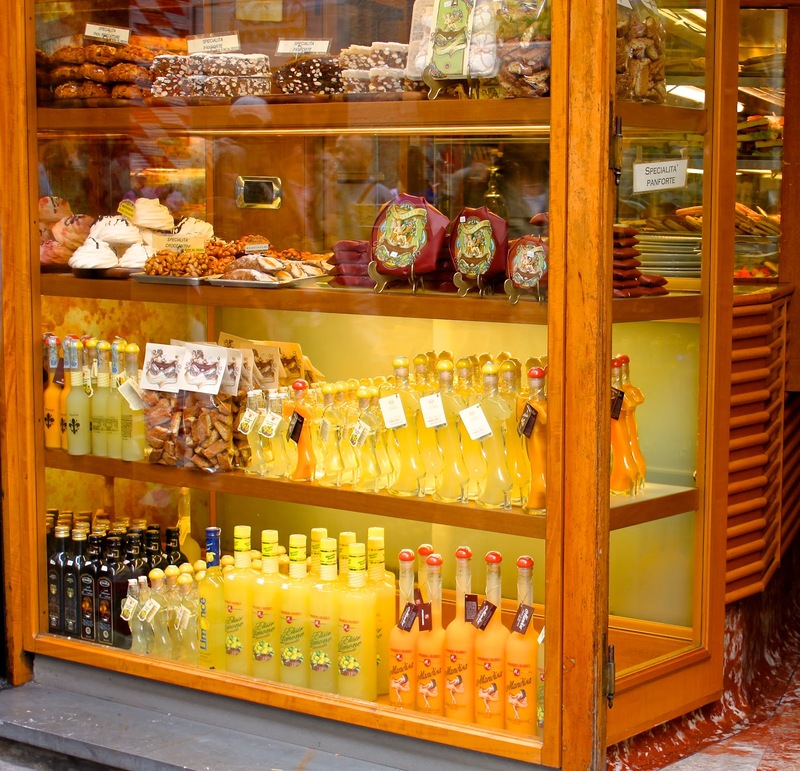 I can’t get over all of the limoncello and orange liqueurs offered there. The Amalfi coast is really, really pretty. I would have had a very hard time saying goodbye to Italy. 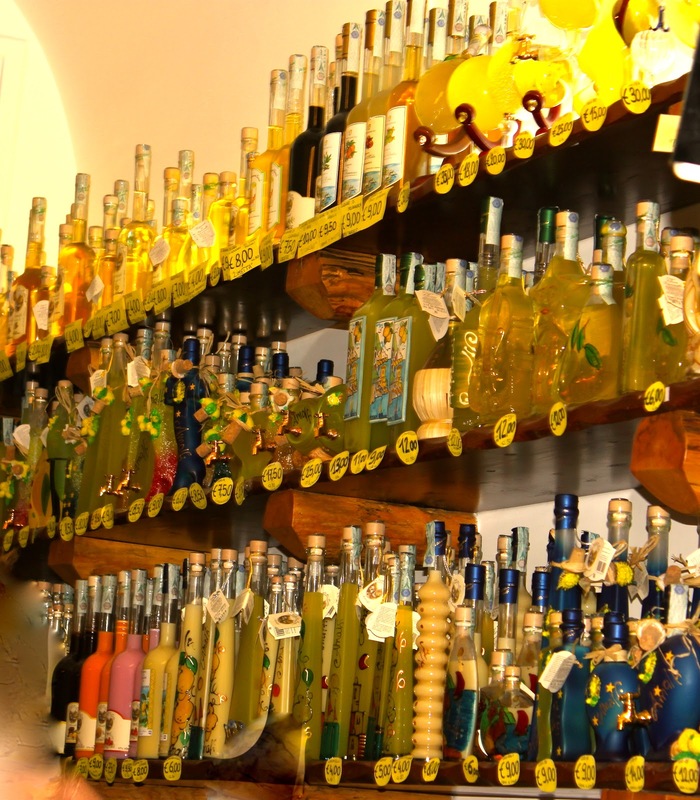 I spent a week in Positano last year… every litle bottle of limoncello, begged a sip. I have even made my own (a pitiful try at bringing in the flavor of Amalfi) I smiled at each photo of lemons on the Amalfi coast. What a beautiful display of yellow! 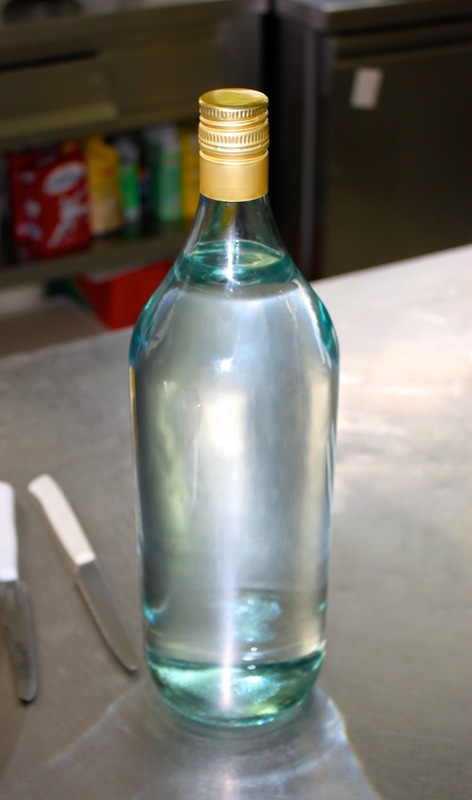 My favourites are the bottles photos – they are great! I believe you’ve convinced me that lemons are king there :-). It’s hard to believe they live atop each other up the steep hillside. 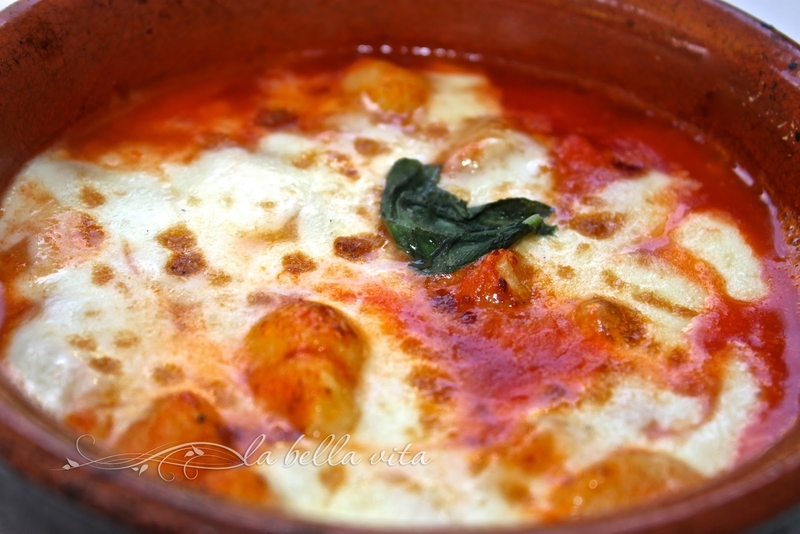 I just bought the Mamma Agata cookbook and have been looking at the Amalfi Coast on Google Earth and other pictures. The scenery is dazzling but the roads look like white knucklers. It’s great you and your mom had the opportunity to make this trip – I only wish you’d taken Bev and I along. Roz, this post is beautiful! I love this part of Italy, I spent a few days after my wedding travelling around la costa Amalfitana. In Sorrento I bought a set of small limoncello glasses/tray and I still have it! I use it only for drinking limoncello. 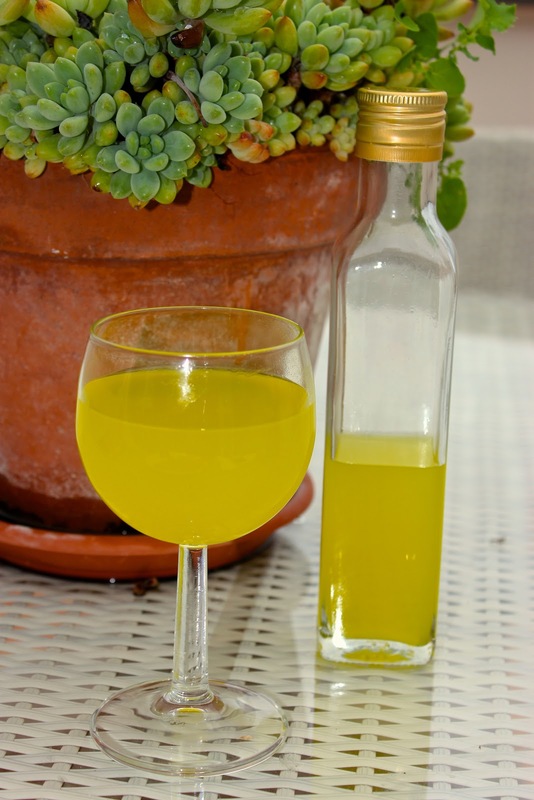 My Mum makes her own limoncello (with Amalfi Lemons!!) and I always have a bottle at home (in my freezer!). You look so happy, what a beautiful experience. Hi Roz! Definitely definitely definitely feel free to email me! jhbruno87@gmail.com About anything medical related or even if you just want to chat!! 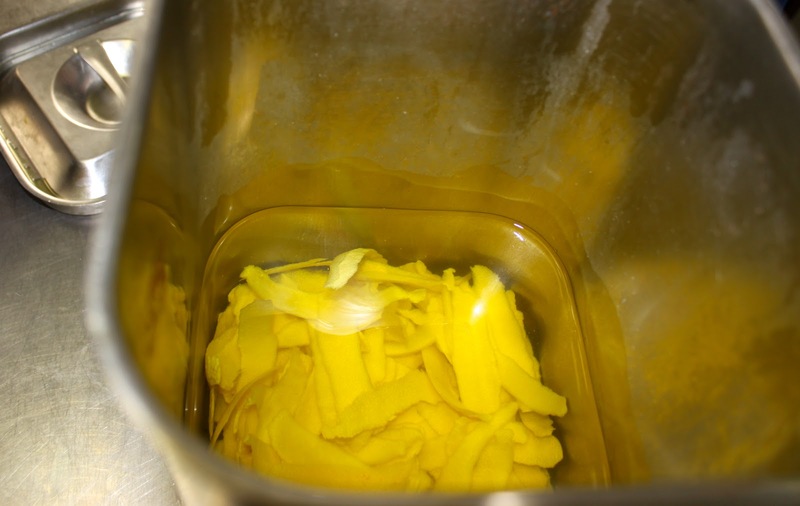 Buonissimo il limoncello, e poi è anche molto versatile in cucina. Bellissima la foto con la tua mamma. Un abbraccio, buona giornata Daniela. Thanks for the great set of photos for us to go through. 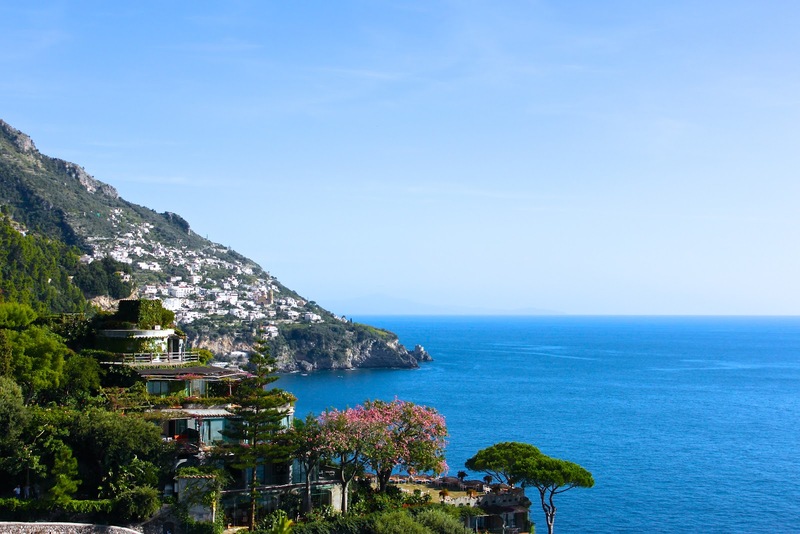 Our recent rip to the Amalfi Coast was glorious. It is truly a beautiful part of Italy. And I so love Limoncello. 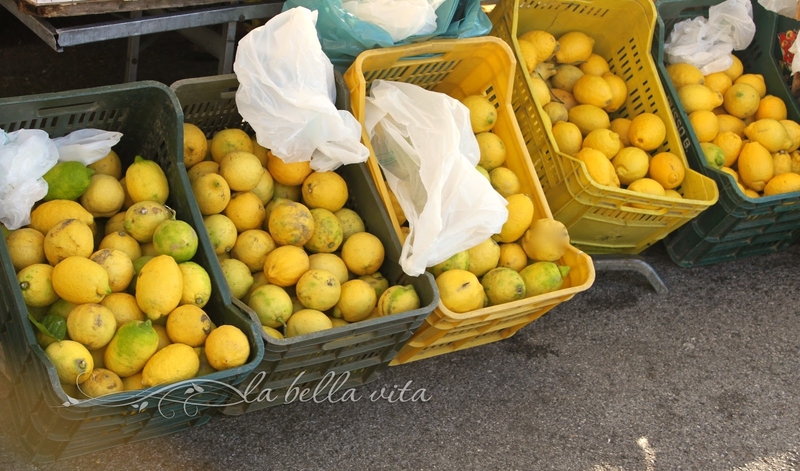 Oh what a gorgeous post and stunning photos of the area, of the shops, of the beautiful lemons. I agree with Marie that the best shot is the one of you and your mom. It’s so wonderful that you could share this beautiful trip. Those plates brought back memories of my last trip to the Amalfi coast. One of those lemon plates is hanging in my kitchen. Great pictures. And thanks for the recipe. 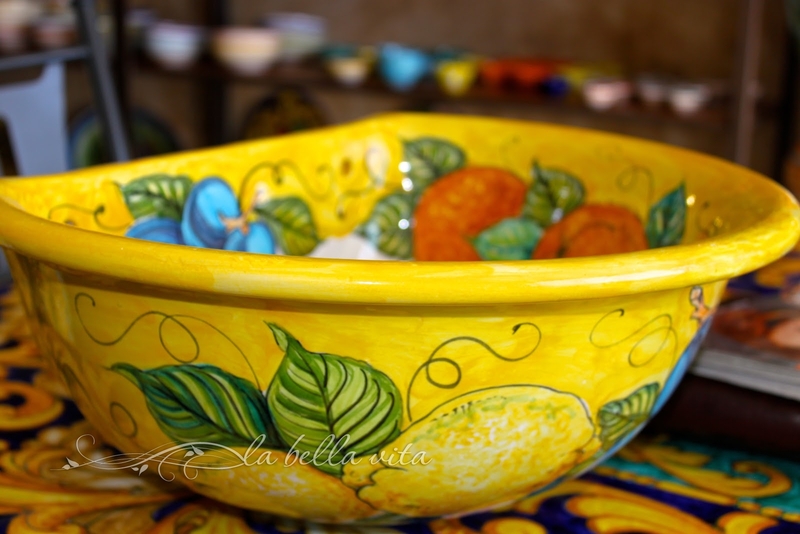 I also have my piece of lemon pottery from the Amalfi Coast. I don’t remember meals being so expensive though! What a beautiful post! The picture of you and your mom is precious…what wonderful memories! 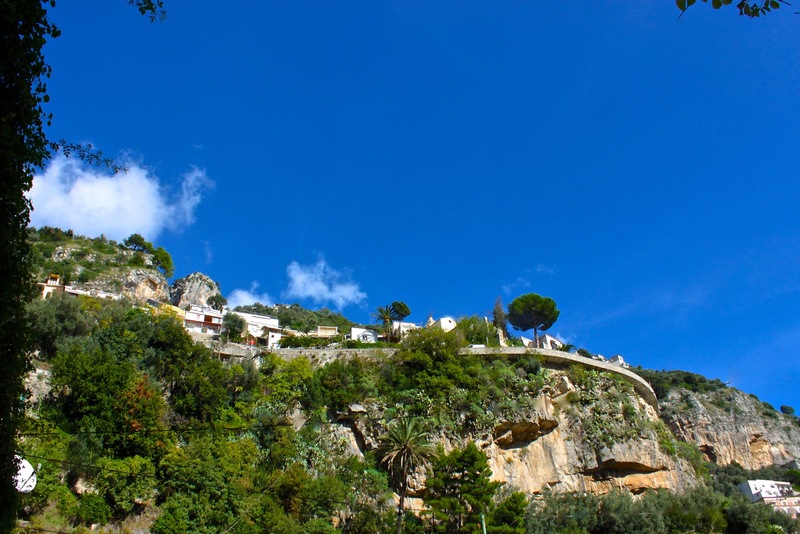 I just love the Amalfi coast…what I don’t love are the hair pin narrow roads and the crazy drivers. What a wonderful time you must have had with your mother. Oh I am so jealous! Your photos and story are wonderful. You are one lucky lady – I have dreamed of a trip to Italy. I want to make pasta with an old Italian woman who can’t speak English! Certainly a dream come true. 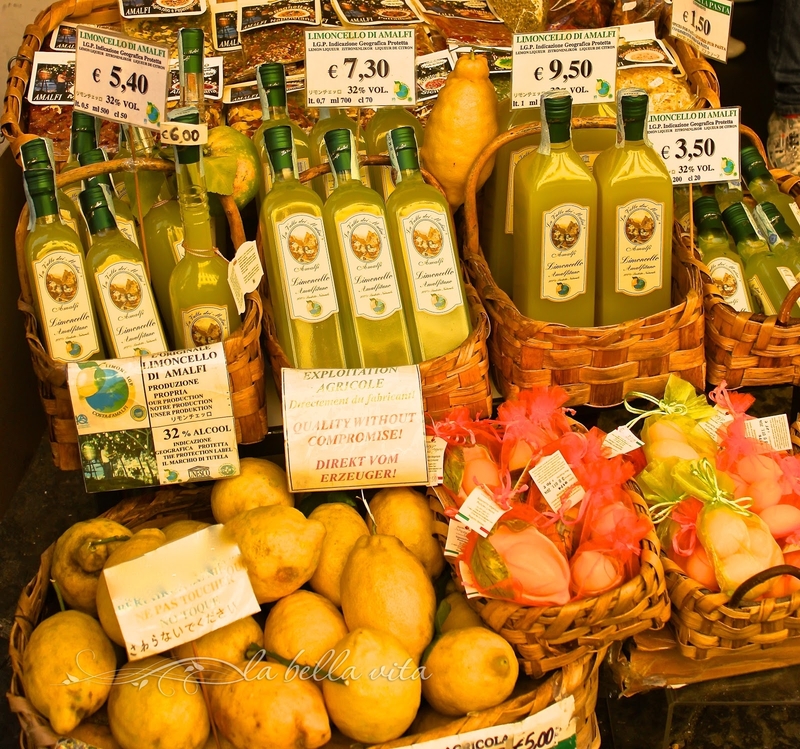 Now I want to make limoncello! 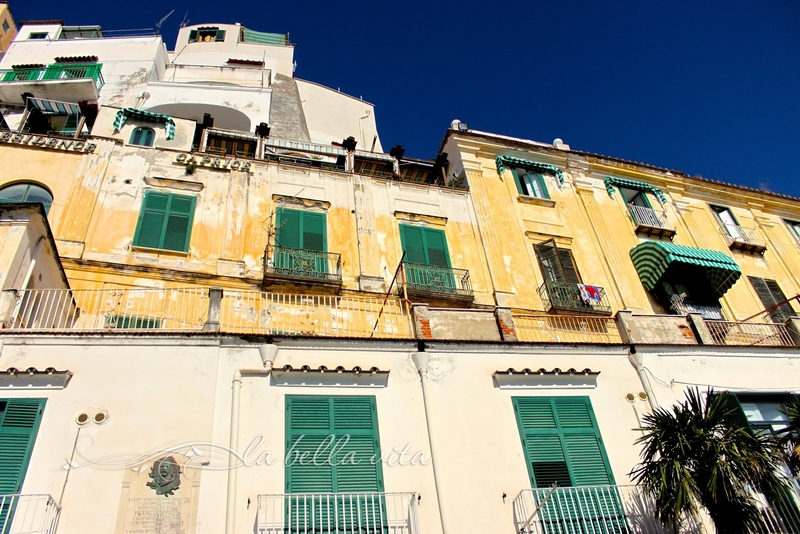 A wonderful post which came alive for me on the page as I know the Amalfi area very well. Oh my, that’s totally awesome! been in Sorrento (close to Amalfi) for a conference, and guess how much did I follow the conference? 😉 could not help just walking around and smelling the scent of the lemmons… beautiful post and pictures and recipe and you and your mom look just awesome with the colorful aprons! I have certainly enjoyed your recent travels, sigh! Just stopping by to wish you and your family a very Happy and Blessed Thanksgiving! OMG! What a fabulous post. What a journey. I have been scratching my head because I have full tree of Meyer lemons. Oh, I so know what I am going to do now….. Limoncello!!! Happy Thanksgiving to you Roz! Roz, welcome home! I must catch up with you when I have some more time. I love every lemon in this post from the first photo to the last —even the sunset was lemon hued! Your pictures are so gorgeous. What an adventure! 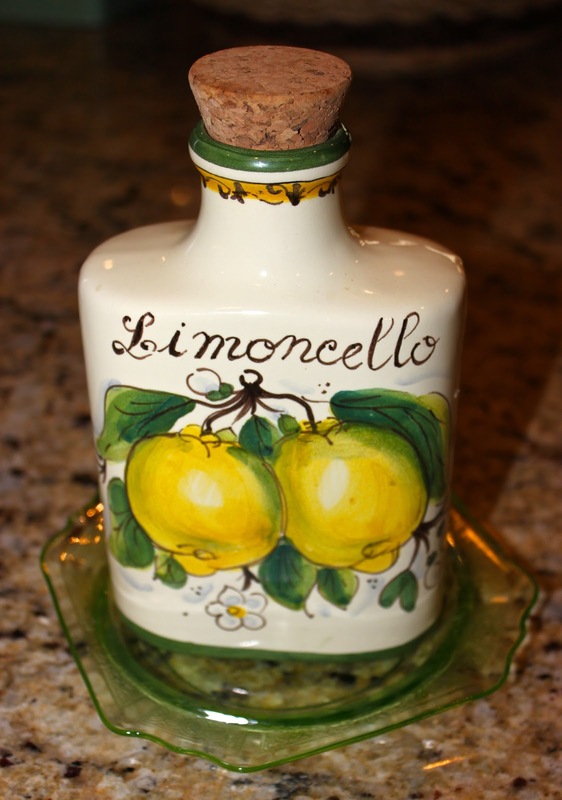 I absolutely adore limoncello! Hola Roz: Te agradezco la visita y los comentarios en mi blog. Gracias a eso he podido conocer el tuyo, que me encanta. Me quedo de seguidora, creo que hay muchas cosas interesantes que quiero leer aquí. great post honey , i really love all these photos! Oh, I love lemons and limoncello! A wonderful post. Thanks for sharing your lovely pictures with us. 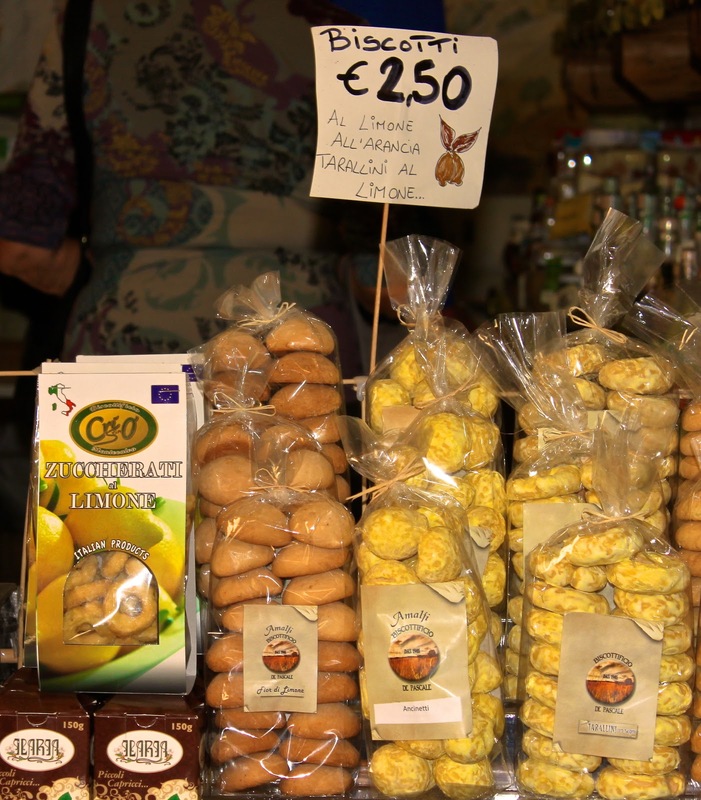 I just got back from a 12 day mediterrian cruise and was searching for a recipe from the Sorrento area for the delicious lemon cakes with the limoncello in them. What a wonderful post you created. 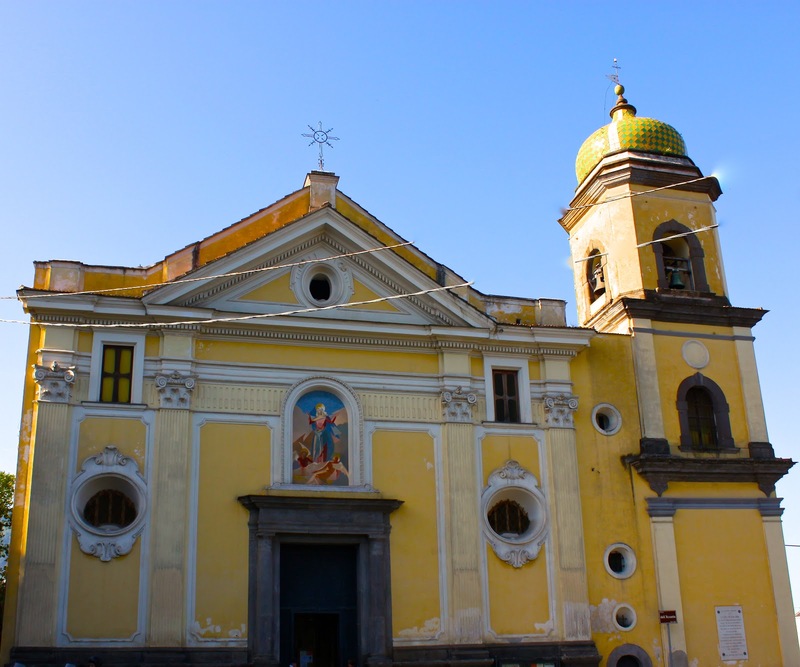 We only had a short tour of the area, but your photos have made me remember and almost taste and smell the lemons and limoncello, I will definitely be going back. Positano and Sorrento were amazing. Thanks again for creating your post and bringing back and wonderful memory and awesome taste experience. I’m sure you know it, but your picture are amazing and make me want to try limoncello this second. Thank you for sharing. This post is so refreshing visually and emotionally. Is not just about a wonderful place and great looking lemons :), but also your style of writing is so full of life and love. You are a true inspiration and your blog is like a breath of air. Thank you. Thank you for this wonderful post! My MIL traveled to Positano, Italy from New York with her friend back in ’04. She brought back Limoncello bottles as gifts. Fast forward to 2017 and her friend has passed away and my MIL now lives in Texas. She just sent me 10 Meyer lemons from her tree. She told me about a recipe she wrote down from her trip to Italy, when she talked with a woman making a homemade batch. She couldn’t find it, but yours seems to match what she described! 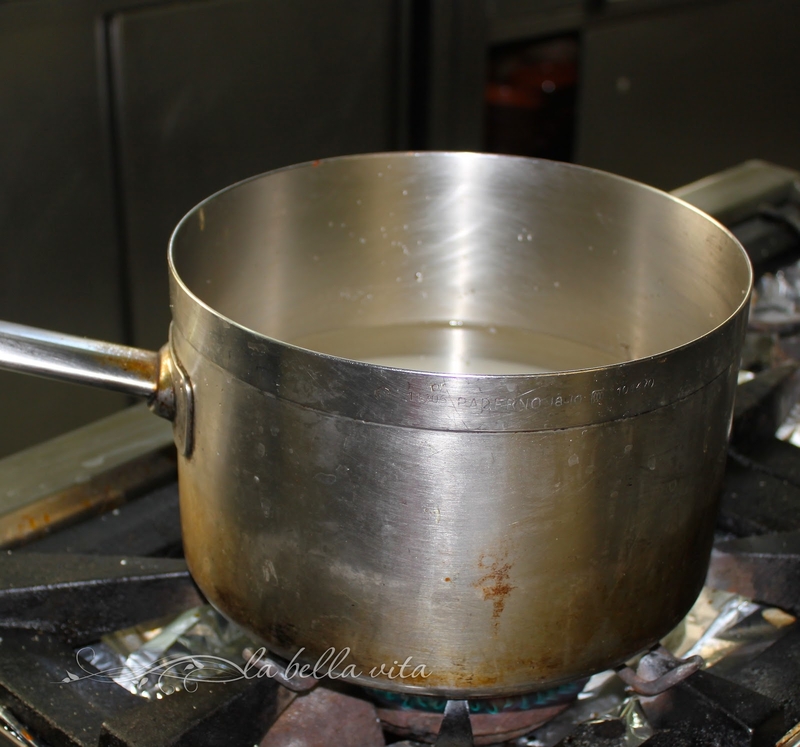 Now I can make it for her and tell her about this post so she knows it is an authentic Positano recipe! What an incredible story that you are so kind to share with me about your MIL. 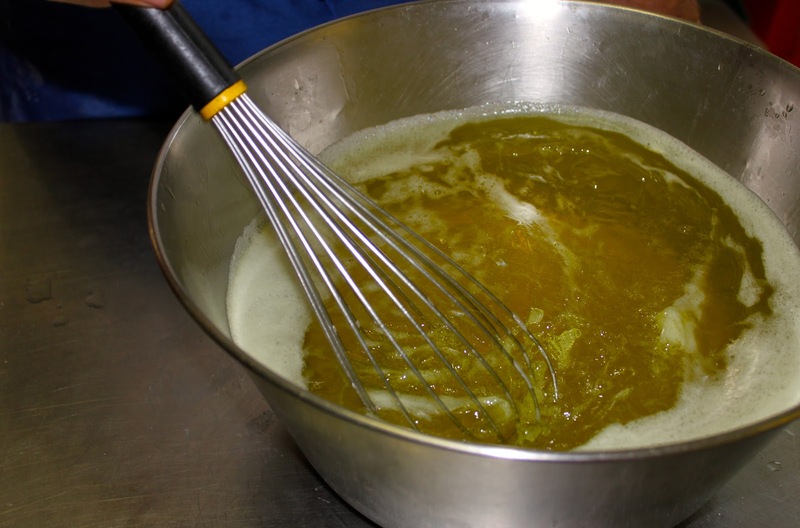 I do hope that she found this blog post in order to make limoncello from a Positano chef. You have made my day so bright with your story and I thank you. 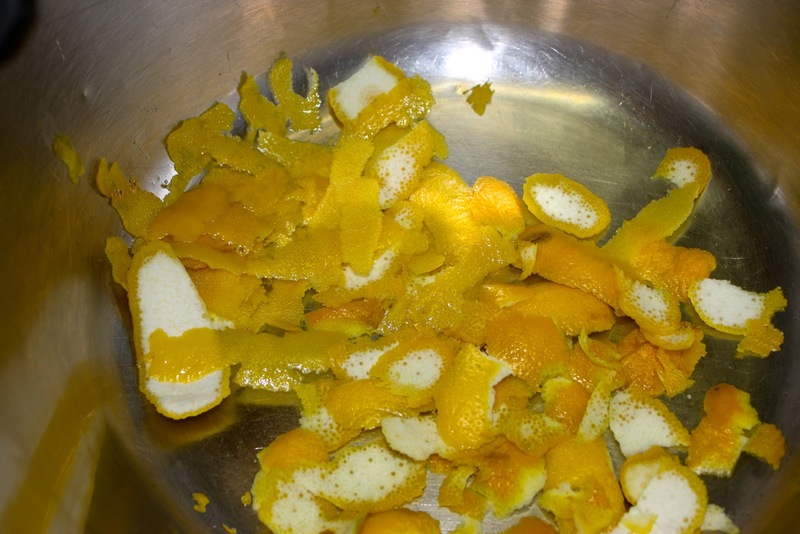 Yes, I made a batch from her Meyer lemons and it was delicious! Poured it into several 5 oz. woozy bottles and made pretty labels and gave out as gifts to family and friends. My MIL loved it and had her friends over to try it. On my birthday she gave me petite Limoncello glasses! Definitely making another batch.